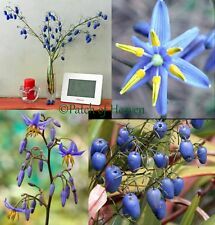 Dianella pavopennacea var. major R.J.F.Hend. Henderson, R.J.F. in George, A.S. (1987) Flora of Australia 45: 482. Type: cultivated Royal Botanic Gardens, Sydney, N.S.W., (from transplants from between Pascoe and Wenlock rivers near Wenlock, northern Qld, coll. J.T.Waterhouse, 1974), A.N.Rodd 2702; holo: BRI; iso: NSW. Plants forming dense stands of several square metres. Stems up to 60 cm long, erect or sigmoidally spreading. 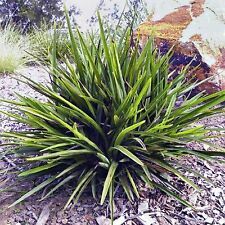 Leaves clustered towards the apex of the stems, 30-55 cm long; lamina 30-40 x 0.8-1.5 cm, petioles about 6-7 cm long; keel smooth. Inflorescence exceeding leaves. Cymules progressively contracting outwards, 5-20 -flowered. Perianth segments sky blue to purple, 4.5-7 mm long. Sepals 5-7 -nerved. Petals 3-4 -nerved. Anthers yellow-green to reddish brown, 2.5-3.5 mm long, filament swelling yellow. Style 3-4 mm long. Fruit a berry 5-8 mm long. Seed 2.8-3.9 mm long, testa minutely areolate, glossy black. Occurs in CYP with a single record southwest of Townsville. Altitudinal range from near sea level to 475 m. Grows in rainforest margin, open Eucalypt forest, vineforest, Eucalypt woodland, Melaleuca woodland and in heathland near the coast. Buy It Now for only: US 274,23 руб. Buy It Now for only: US 140,35 руб. Buy It Now for only: US 241,52 руб.